An honest alternative to highway robbery. After stocks (barely) achieved another record high yesterday, they're making more gains this morning, with the S&P 500 (SNPINDEX:^GSPC) and the narrower, price-weighted Dow Jones Industrial Average (DJINDICES:^DJI) up 0.42% and 0.24%, respectively, at 10:05 a.m. EDT. The battle for Dell (UNKNOWN:UNKNOWN) took a new turn at the end of last week when Southeastern Asset Management -- manager of the Longleaf Funds and Icahn Enterprises, one of Carl Icahn's vehicles -- sent a letter to the Dell board of directors outlining a competing offer to the going-private proposal advanced by Michael Dell and Silver Lake Partners. The offer from Southeastern and Icahn is more complicated than the straight $13.65 per-share cash bid from Michael Dell/Silver Lake, but it merits shareholders' consideration. In fact, I think it's the superior offer. This looks like nothing more than daylight robbery, even if the stock price swoon did provide some cover. (Worse still, Dell will pay Michael Dell a "break-up fee" of at least $180 million and up to $450 million if the deal isn't completed!) Unfortunately, the recent trading range for Dell shares -- close to, but below, the $13.65 per-share offer -- suggests that the market believes the acquisition will go through. 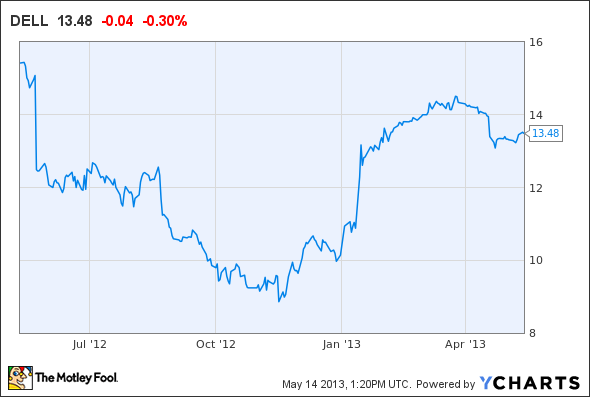 The Southeastern/Icahn offer hasn't changed that; Dell shares closed at $13.48 yesterday. The new offer enables Dell shareholders to continue holding their equity position and, in addition, elect to receive either $12 in cash or $12 in additional shares, valued at $1.65 per share. Both Southeastern and Icahn would choose to receive the additional shares instead of the cash payment. The structure of this offer, while slightly more complicated, is much better aligned with the interests of existing shareholders. If you are part of this group, I think this is the better option, and I recommend you read the case Southeastern and Icahn put forward in their letter.